It depends on whether you like to walk on road. Theres some old infrastructure on the bog sections, but in general itâ€™s pretty wild. We passed through here in a lot of rain, so we didnâ€™t get to see some of the spots that are supposed to be beautiful, such as Maghery beach. Thereâ€™s a campsite near Crolly, but beware of of midges! A looped walk passing through Burtonport, Crolly and Maghery. 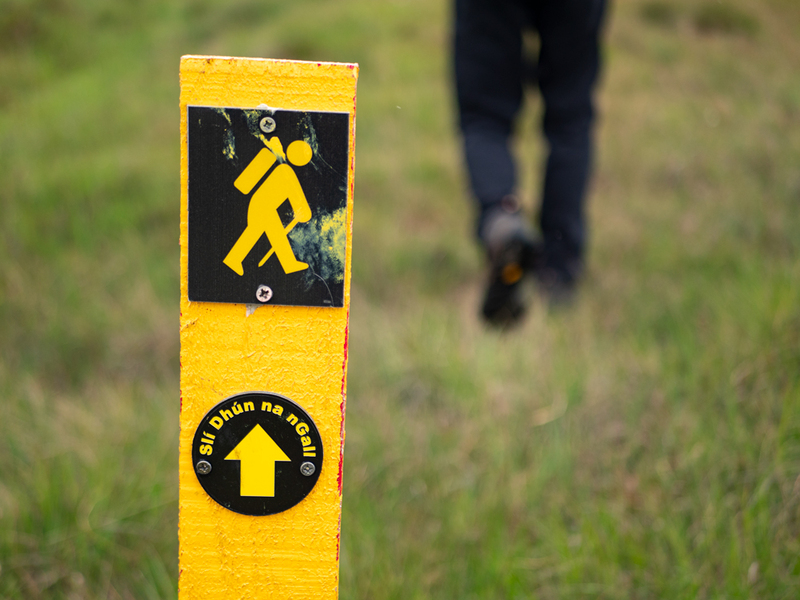 We set out on of first day of this trail from Dungloe, having stayed at The River House B&B and Hostel (one of our favourite accommodation places this whole project). Weâ€™d walked the first 10km of this trail before on our way out to Arranmore Island the day before, and it passed quickly - itâ€™s interesting how sometimes knowing a route makes it feel faster, and then sometimes makes it drag on for an eternity. This first 10+km is all small roads, so even though we didnâ€™t start all that early we make pretty decent time. We stop at a petrol station for coffee and end up pouring it down a drain outside. I pride myself on drinking all coffee. Except that one. The small roads keep coming, as just as we start to get tired of looking at tarmac, we turn off onto an old railway line. Itâ€™s crazy just how much railway must have criss-crossed and tangled around this country; it seems like every village is discovering or uncovering an old line and converting it into a public space. Itâ€™s really great! Weâ€™re never going to finish walking around the country at the rate new things are opening! The new walk snakes between the small lakes, and all too soon comes to an end. As we hit the tarmac again we dig out some ear phones and start listening to books to help us ignore the hard ground under our feet. Our end goal for the evening was Sleepy Hollows, an adult only campsite (an unusual thing in Ireland). We arrive, pay, and head off in the direction of a vague hand wave. Itâ€™s very picturesque, extremely picturesque even. Thereâ€™s a small area for camper vans, and a few other tent campers scattered around the place. We pitch up our tent slowly, enjoying the evening sun. The facilities there are rustic, so we head down towards what looks like a village. Thereâ€™s certainly a few houses and a very large pub. Going inside I canâ€™t believe just how big it is, and well staffed. Itâ€™s only once weâ€™re sitting that we properly look around at whatâ€™s hanging on the walls and written on the posters. So we were at the training ground of Enya! The walls were covered in platinum albums, signed tour t-shirts, and old photographs. It seemed like it was an Irish music mecca, and felt like a strange thing to stumble upon. We eat our veggie stir-fry and head back to the tent. Itâ€™s wasnâ€™t the silent night of sleep we were hoping for - guitars around camp fires and general campsite rumbling were abundant, but we did sleep. I remember feeling quite groggy as I opened my eyes, and then being shocked fully awake as I saw our tent. It was crawling with midges. Ireland is full of bog, and therefore full of midges. Even though we felt no great love towards them, we were certainly used to them. We were pro midge killers whenever they got inside the tent. And it certainly isnâ€™t unusual to see them crawling on the inside of the rain fly in the morning. But I have never seen that many before. It was a swarm. Carl was already lying there wide-eyed. Weâ€™d seen some reviews online mention that they were bad at this campsite, but weâ€™d pretty much ignored them - theyâ€™d always been tolerable before. Iâ€™m not going to go into too much detail as it still makes me feel a little queasy thinking back on them. What I will say is that they were the most aggressive midges either of us have ever encountered. We didnâ€™t take the tent down in a record speed as every few seconds I had to pull one out of my eye, or just generally fight my way through them, but in general we did get moving very quick that morning. (note: Iâ€™m assuming the drought this summer was actually pretty great midge weather, and thatâ€™s why there were so many). The day starts off on roads, and we wind our way through the slightly desolate midlands that are The Rosses. The roads are completely empty so we have no worries about traffic, but it is tiring on the feet. We spend a long time walking through a slow moving, breath-taking landscape. Itâ€™s funny, and a little sad, how once youâ€™ve been walking through the same scene/view for a long period of time it starts to loose itâ€™s shine, and all you can really see is how long and straight the road is ahead of you. Weâ€™re a few hours in and itâ€™s still early in the day. At least our speedy morning departure was good for something! As weâ€™re taking a quick break we get a weather forecast update, and see a wall of rain heading our way. We think about this in silence. 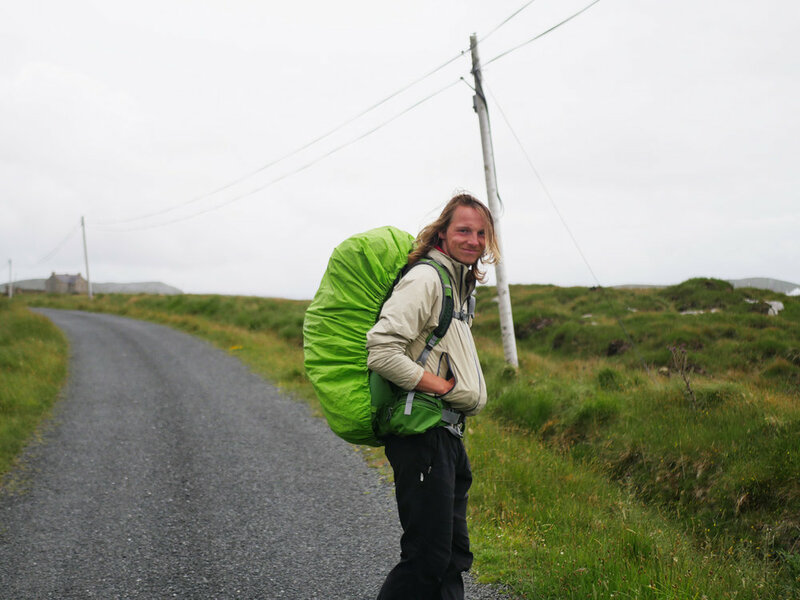 So far we hadnâ€™t found anywhere to aim for that evening - there were no campsites, hostels, air-bnbs, or particularly appealing wild camping areas. Itâ€™s always harder to find places on road heavy trails and so far the land around us had been either too rocky or too boggy to pitch a tent. We count the boxes on our map and think that maybe we might be able to finish the whole trail that day. Itâ€™s tempting, so we call the hostel in Dungloe to see if theyâ€™ve any room that night: yes, thereâ€™s still a bed or two free. That settles it for us. We now had a goal! By the time we reach the main off road section of the day the sky has started to drizzle and spit at us. Itâ€™s a fun hike out over some karst sheep fields, and we slowly gain some height. We pass the edges of forested land, walking along some small ridges. The land is wet after the recent storm, but not terrible. Reaching the other side of the hill, we finally get a real view out over the Rosses, and suddenly I stop thinking desolate and start seeing beauty. There are so many lakes, scattered all over the landscape. I think we counted 14 from our view point, all with erratic edges, the water glistening in the haze from the low clouds. And in all these lakes are even more islands; some with sheep, some with trees, all looking like theyâ€™re from a story book. We could see the whole way back to the coast, and saw just how much walking was still in front of us. The rain began to spit a bit harder, so we pushed on. The rain got worse, and slowly it wormed itâ€™s way through all our layers, soaking everything from hats and socks with abundant enthusiasm. Hoods and hair stuck to faces. We slowly descended to Maghery - a small coastal village famous for itâ€™s long sandy beaches. We looked out at the tossing waves and windswept sand from a distance, and then marched on. Iâ€™ve noticed that people never offer us a lift when itâ€™s raining; when itâ€™s sunny, weâ€™re just normal people out for a hike, but when itâ€™s raining we get very different looks, that we must be completely deranged to be outside. I do understand that letting two completely saturated walkers means your whole car is going to get wet, so I donâ€™t be-grudge anyoneâ€¦. but maybe donâ€™t stare at us so much. Not long after weâ€™d left Maghery Carl heard a bird call. I barely noticed it, but he immediately recognised it as a corncrake - a small shy bird that typically lives in long grass areas. At the moment it is red-listed due to severe declines in the breeding population, and there are ongoing major conservation measures being put in place to protect this endangered species. Carl is ecstatic to have heard one, and spends the next while searching on his phone how to report the location. Eventually he finds a number listed and calls - itâ€™s not actually the right number, but it is someone at birdwatch Ireland, so they take all the details and say theyâ€™ll find the right person to pass it on to. Itâ€™s a small distraction from the wind and the rain, but itâ€™s enough to help the last few kilometres pass. We squelch our way back into the centre of Dungloe. Carl heads up to the hostel while I stop into the chipper down the road. I peel out some dripping money from my pocket and the guy behind the counter jokes with me while I huddle beside the radiator, waiting for our burgers. Arriving into the River House Hostel/B&B my shoes leave literal puddles with every step. The woman who runs the place laughs at the state of us, but also gives us a basket to throw all our wet clothes into, saying to just leave the basket in the hall and sheâ€™ll get it sorted. She is one of my favourite hosts. Once weâ€™re dry (but maybe not quite clean) we sit on the floor and eat our burgers and chips. They taste like the finest food weâ€™ve ever eaten. Long days are always exhausting, and long wet days are just plain miserable. But theyâ€™re some of the days Iâ€™m proudest to have pushed through and finished. 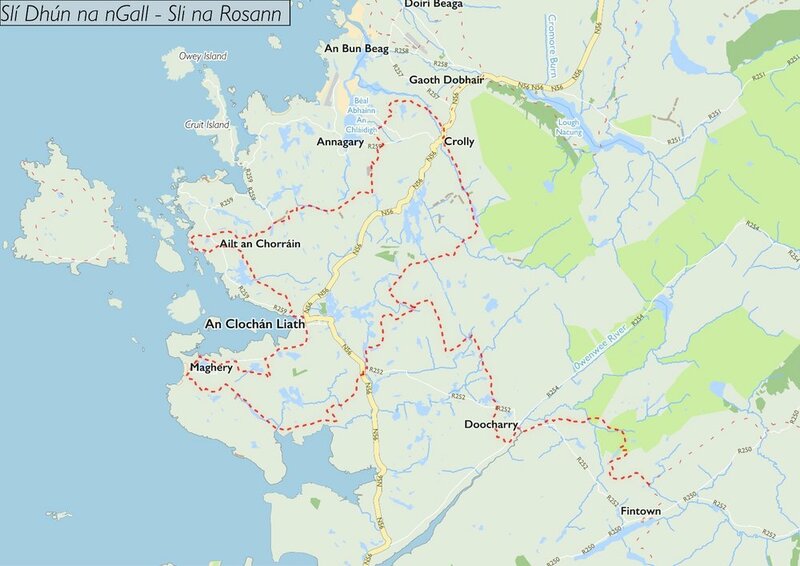 I never planned on it taking me so long to write about the trails weâ€™ve walked so far this year - in case the blogs are the main way that you experience our adventure, we did eventually leave Donegal, sticking to the west coast and making our way further south along the Western Way and the Kerry Way. As I write this right now itâ€™s the 10th of October. We took the month of September off from walking - we were both pretty exhausted, and decided we needed a base to work from as opposed to trying to live in tents and hostels all the time. We hadnâ€™t really decided to take September off at the end of the Kerry Way - we were hoping that staying maybe at week with some family would recharge us. But have you ever noticed that as soon as you take a break from something that is very physically taxing, youâ€™re whole body kind of implodes? Itâ€™s what happened to us - chest infections, asthma attacks, flu, and lots of other smaller - yet still annoying! - ailments. And so we went from taking a week off, to realising we probably needed more than that. Now itâ€™s October, and during our break weâ€™ve found somewhere to live between trails. Weâ€™re currently planning which trails we can do over winter, and when we can do them. Itâ€™s a slow process - we never really plan this much! - but itâ€™s worth it. Seeing as no one has ever walked all the National Waymarked Trails weâ€™re under no real time pressure to finish them, although sooner rather than later would be nice at this stage. I canâ€™t believe that 18 months ago we were planning on doing it all in 6 months! The next blog post is the SlÃ­ an Earagail!